Diji Chandrasekharan Behr and Klas Sander (World Bank), Kenneth Rosenbaum, Irene Angeletti and Cristina Dengel (consultants). This work was jointly financed by TFESSD and PROFOR. Partnerships between communities and external partners (private sector, NGOs and government) have been touted as a way to enhance the contribution of investments in the forest sector to alleviating poverty and advancing development. Given the growing prominence of partnership in carbon markets and production of timber, pulp and paper, it is essential to understand what makes partnerships work. Using an evidence-based approach, the primary objective of this study was to provide insights for existing and emerging collaborative arrangements. The study also aimed to provide guidance on making and keeping contract-based partnerships and benefit sharing arrangements. The target audience included government, private sector, non-governmental organization, development partners, and managers of forest programs offering payments for carbon sequestration and reduced emissions from deforestation and degradation (REDD). Four factors emerged as universally important factors in effective and lasting collaborative arrangements among the more than 60 partnerships examined: mutual respect, trust, practicality, and communication. Using forests imposes local costs, whether the use involves production or environmental services. Benefit sharing arrangements can ensure that the communities and households that bear these costs share in the benefits of the use. Properly employed, these arrangements can serve to provide needed incentives and make forest use activities more sustainable and more commercially viable. Benefit sharing should include both cash and non-cash options, and aim to engage local communities in productive activities that generate positive local outcomes. Contracts and other legal documents, while not ends in themselves need to be legally valid, clear, understandable, address points that promote agreement-keeping, provide ways to handle disputes, and consider issues that have led to disagreements. 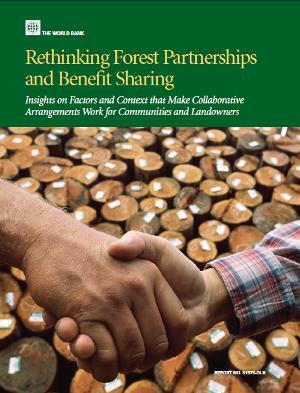 For more detailed findings, see Rethinking Forest Partnerships and Benefit Sharing and summaries written for different audiences. The findings of the study were presented and shared widely at the World Forestry Congress 2009 and at Forest Carbon Partnership Facility meetings, and COFO 2010. The findings of this study have also been used to underpin inputs to The Forest Dialogue on Locally Controlled Forests. PROFOR is funding follow-up case studies in several countries. Author : Diji Chandrasekharan Behr and Klas Sander (World Bank), Kenneth Rosenbaum, Irene Angeletti and Cristina Dengel (consultants). This work was jointly financed by TFESSD and PROFOR.